Vintage From Paul is delighted to offer these Federal Glass Windsor Royal Brighton Sugar Bowl. 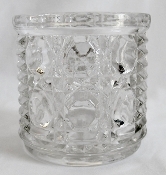 The Federal Glass Company initially issued the Windsor pattern in the early 1970's. The Federal Glass Windsor Royal Brighton Sugar Bowl stands 3-1/4 inches in height, measures 3-1/8 inches in diameter at the top. Each available Federal Glass Windsor Royal Brighton Sugar Bowl is in pristine unused condition.